My mom is into geneaology research. Occasionally her discoveries are interesting. We’re descended from executed Salem “witch” Mary Eastey, who was obviously not a witch but a good wife and mother who wrote a deeply Christian letter forgiving her accusers and killers. On my dad’s side I’m descended from Joseph Broussard, who led the French Catholic Accadians out of present day British Columbia where the English conquered and were not especially kind particularly in terms of religious freedom, down to Louisiana–the Cajuns. Then a couple of years ago Mom (whose name happens to be Margaret) found that we’re descended from Saint (Queen) Margaret of Scotland. Today’s St Margaret’s feast day, so I’ve been reading to know more about her. 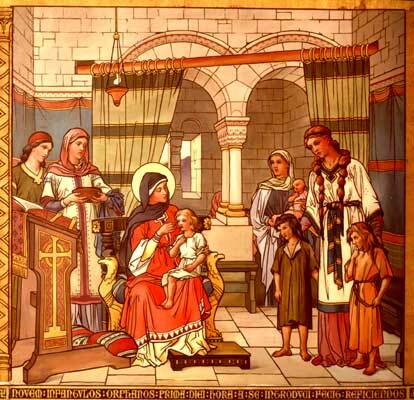 Saint Margaret of Scotland, to make a long story short, was born in Hungary in 1045 the granddaughter of King Edward Ironside of England, and came to England before getting shipwrecked on the coast of Scotland where she became the bride of Scottish king Malcolm III. Malcolm seems to have been somewhat uncouth, and not particularly religious, and not literate, but clearly he deeply loved Margaret. Today St Margaret of Scotland is one of the most loved married Saints. She was a devout, contemplative and educated Catholic and her husband lent his royal authority and resources to her many initiatives of charity to the poor and bringing religious practice in the country up to par and into sync with the universal Church in union with Rome. She was an ideal mother, and besides her own children she nurtured many little orphans herself in the midst of royal splendor. She corrected the schedule of the Lenten fast in that country in accord with the universal calendar and was an edifying example to her people of keeping the fast in accord with Catholic precept, and kept an Advent fast as well. Shortage of priests meant Mass was not always available to all the people, but she urged and educated people to observe the Church’s precept of Easter Communion. 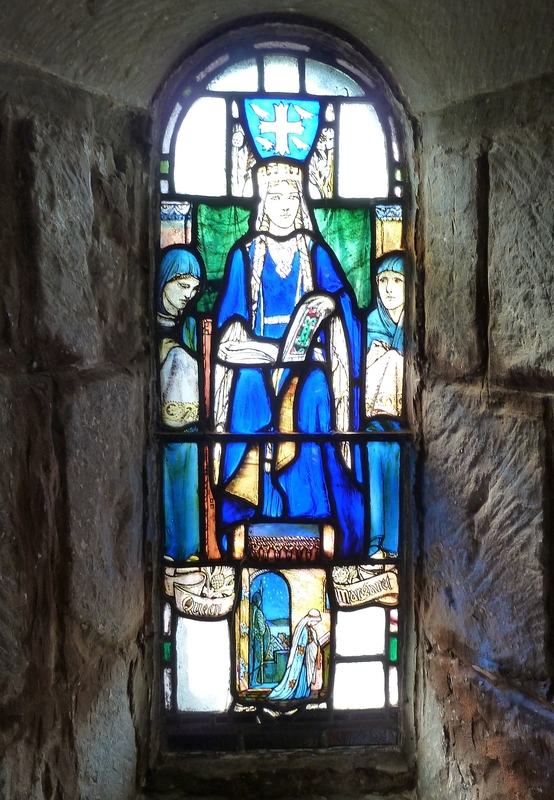 Queen Margaret went out to visit the independent minded Celtic hermits in the countryside who were part of the legacy of the monk St Columba’s 7th c evangelization of Scotland, begging their prayers and asking them to direct her to do some work of charity to the poor. I find online that St Andrew’s Episcopal Church on Regent Street is having a choral Evensong (Book of Common Prayer type version of Vespers/Evening Prayer) tonight in honor of my greatgreatgreatetc grandmother’s feast day. Anglicans cherish this Saint as part of their heritage too; she must be praying for Christian unity as in her day she strengthened the unity with Rome, of the Christians in Scotland. I won’t be there, but heading to Mass at St Paul’s soon where I hope her propers will be used–she shares her feast day with St Gertrude and the priests can pick which one. I know I will be praying for St Margaret’s intercession for myself and all my family. I had a thought today. I pray every day at Evening Prayer for all of my ancestors and relatives (up to and including all people) who have died and are being purified in Purgatory so they can be in the immediate presence of God in heaven. Saint Margaret similarly, from her perspective before the face of God in eternity, is praying every day for all her descendents and relatives, including me. A priest said that to me today, after someone told him St Margaret was my ancestor: she has surely been praying for you all along! What good friends we have in the Saints! And what good family! It’s just the few that are canonized the Church attests infallibly are there for sure, and we can ask them with confidence to pray to God for us, though we may not know the names of all who are in our family tree who are among the blessed, and I know I feel a special confidence they will not refuse or neglect to pray for us! If you have a canonized Saint in your family tree, post a comment and tell. That is VERY cool, Elizabeth. I am also descended from a Salem witch, Mary Toothaker, but I don’t know anything more about her like you know about your “witch.” As far as a saint, my Mother’s Father’s mother said if your children weren’t Irish, they weren’t worth having.. So thank goodness I am part Irish/Scottish/Celtic. My Father’s father said they were spit on by the Jews back in the old country. Was that the persecution Jesus said would happen for those who suffered for His Namessake? Thank you for the great story about your ancestry! St. Margaret, pray for us! You have a beautiful Saint ancestor! Praise be to God! I really enjoyed reading about how you’re related to St. Margaret of Scotland, Elizabeth. I’m related through marriage on my mom’s side( somewhat distantly)– to St. Eugene Guanella, who was only recently proclaimed a saint. He worked directly with St. John Bosco. Also, in 1492, Oct. 10th, one of my relatives on my mom’s side (maiden name Buzzetti) in the remote village in the Alps of Northern Italy, Gallivaggio (an hour straight north of Milan) saw the Blessed Mother. She and another little girl were gathering chesnuts under a tree, and the Madonna appeared holding baby Jesus. She had a strict warning for the townspeople. They must stop working on Sundays, and keep Sundays, and feast days holier, or else her Son would be obliged to send a punishment. Also, she said interestingly enough, that the Sabbath rest is supposed to begin on Saturday at 3:00 p.m. (the hour of Mercy). She requested a chapel to be built on the spot. Hence, a beautiful church that Tim and I saw when we were priviledged to travel there some years ago. Also, some of her virginal blood spilled on the boulder, which she was standing on. That boulder is still under the main altar. She is called the “Madonna of Misericordia, or Mercy”. The people did convert and many blessings came. Even popes have visited the place, and given many gifts, including gold crowns. It is an approved apparition. I loved being there, in the Alps. The cemetary was full of Buzzetti’s. Just mention that you’re a Buzzetti, and instantly, everyone befriends you, even though you don’t speak Italian, and they don’t speak English. My mom and dad have been there twice now. I know the Blessed Mother is working on them. There is a book that we have about it, with lots of colorful pictures. I’d like to show it to you, sometime. God Bless you, Elizabeth. My family line desends from Margaret as well, through Matilda. Pretty cool. Margaret is my 27th great grandmother.. Blessings to us all. St Margaret is also my 31st great-grandmother, and her great-uncle was St Edward the Confessor. Juan Ruperto Sauza y Tuazon, the son of Miguel Juan Santiago Sauza y Berenguer de Marquina, the son of Ysabel Berenguer de Marquina y Sumulong, the daughter of Félix Berenguer de Marquina y FitzGerald, Virrey de Nueva España, the son of Mary FitzGerald, the daughter of John FitzGerald, the son of Sir Thomas FitzGerald, the son of Robert FitzGerald, the son of Katherine Horsey, the daughter of John Power, 5th Baron le Power and Coroghmore, the son of Helen Somerset, 3rd wife of Thomas Butler, widow of John Power, the daughter of Ellen Roche, the daughter of David Roche, 5th Viscount Roche of Fermoy, the son of Grany Roche (MacCarthy), the daughter of Mary FitzMaurice, the daughter of Honoria FitzMaurice, the daughter of James FitzGerald, 6th Earl of Desmond, the son of Gerald fitz Maurice, 3rd Earl Desmond, the son of Maurice FitzGerald, 1st Earl of Desmond, the son of Margaret de Berkeley, the daughter of Thomas de Berkeley, 1st Baron Berkeley, the son of Isabel “de Crouin” de Berkeley, Baroness Berkeley, the son of Richard FitzRoy, Lord of Chilham, the son of Adella de Warenne, Concubine #1 of John “Lackland” of England, the daughter of Hamelin de Warenne, 4th Earl of Surrey, the son of Adelaide de Angers (Possibly Empress Mathilda), the daughter of Matilda of Scotland, the daughter of St. Margaret Queen of Scotland, pray for us! Amen! Our family tree records are kept by my cousin from University of Bristol in England. Hi there. I am also descended from Saint Margaret of Scotland, as well as Saint Matilda of Ringelheim. Isn’t geneology fascinating? She is also my I believe 27th great grandmother!